When a rotting torso is discovered in the vault of New Scotland Yard, it doesn’t take Dr Thomas Bond, Police Surgeon, long to realise that there is a second killer at work in the city where, only a few days before, Jack the Ripper brutally murdered two women in one night. Though just as gruesome, this is the hand of a colder killer, one who lacks Jack’s emotion. And, as more headless and limbless torsos find their way into the Thames, Dr Bond becomes obsessed with finding the killer. As his investigations lead him into an unholy alliance, he starts to wonder: is it a man who has brought mayhem to the streets of London, or a monster? Mayhem introduces us to Dr Thomas Bond, Police Surgeon, a seemingly respectable and professional fellow who harbours more than a few demons of his own, suffering sleepless nights and not averse to trips to the seedy underbelly of the city to sate his desire for opium. With his involvement in the first grim discovery in the confines of Scotland Yard, he embarks on an investigation of his own into this heinous murder, joining forces with a mysterious priest and the real life figure of Aaron Kominski, a man deemed insane in the Ripper investigation and a chief suspect in the original case. 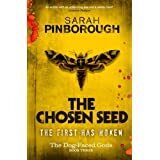 Pinborough’s assured craft of characterisation shines through in this unlikely trinity, with the dour Dr Bond immersed in a world of supernatural influence so readily embraced by the beliefs and experiences of his two cohorts. The priest and Kominski have an unwavering belief in otherworldly forces, which sets them against Bond’s position of a man of science, but Bond’s belief in the tangible is unsettled by the priest’s tales of the curse of the Upir- a folkloric spirit who inhabits a man body baying for blood- and the strength and veracity of Kominski’s visions of the future. 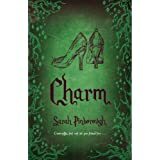 I thought the charaterisation of all three protagonists was extremely well-executed throughout with the variances between their physical and mental characters seeming absolutely authentic, without resorting to the melodramatic characters of the penny dreadful, a trap that too many authors fall into when attempting to capture the spirit of this age. 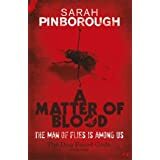 Kominski, in particular, I found most affecting and I admired the way that Pinborough drew so closely on the factual sources of this tormented man’s life to create such a credible character cleverly exposing the humanity that lay beyond his tortured soul. Equally the bringer of tales, the wild-eyed priest, was an extremely effective foil to Dr Bond, and toyed with our reactions to him having a largely quite sinister air throughout. Although I was not immediately enamoured with Dr Bond, who is to be the recurring figure of the series, I was converted by the end to the nuances of his character, and look forward to how the experience of this investigation will colour his actions in the next books. 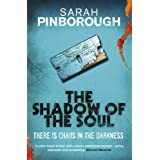 I must confess to having a slight aversion to ostensibly crime thrillers set in this period, having been tainted by reading a right couple of groaners recently- probably the fault laying in the fact that they were chockful of Americanisms and badly edited- but my fears were assuaged instantly. The atmosphere is tangible throughout, capturing the sounds, sights and smells of this iconic period in London’s history. The portrayal of the professional and social world of Dr Bond was perfectly balanced with the poverty and criminality of the world of Kominski, with the barriers of two men in completely different classes falling by the wayside in the hunt to capture a killer. As the storyline unfolded with a sojourn to the world of the Grand Tour and an ill-judged (for one character certainly) stopover in Eastern Europe, the reader is consistently entertained and wrongfooted throughout with the changing locales and a nicely terrifying search for a killer. As you have probably ascertained, I really quite liked Mayhem, and if you enjoy your crime with a twist this will be a good read for you too. 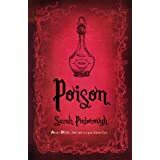 Packed full of attention to historical detail and with a marvellous band of characters, I think this marks the start of a great series. 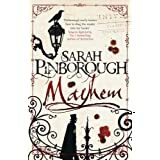 Mayhem is released 25th April (Jo Fletcher Books) but treat yourself to a peek here: Want to read 3 chapters of @SarahPinborough Mayhem completely free? Check it out here: http://www.quercusbooks.co.uk/mayhem/ with sound effects! Oh, both history and a good crime story – my kind of book! I couldn’t agree with you more about how much difference authenticity can make in a story. I’m glad you felt this one was a winner.